Looking for the perfect project or storage addition to your home? Slide-Lok's DIY (Do-It-Yourself) storage systems are perfect for any home project. From DIY garage cabinets, closet cabinets, basement cabinets, kitchen cabinets to overhead storage racks we have something to meet your every storage solution need. Get organized today! Don't let a cluttered garage, storage basement, or messy closet stop you. Call us today for professional help designing a custom storage solution for your storage needs. For the refined looks of a finished home, garage, basement, closet, or kitchen, let us help you get the best quality products in your home at the best possible prices. 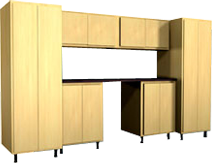 Our modular designed and patented dove-tail joint design makes our cabinets unique and easy to assemble and install anywhere in the home. 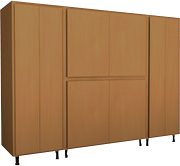 The modular design of our plywood storage cabinets make our cabinets easy to mix and match for any storage needs. If you want to build a little storage now, and add more storage cabinets later, that's no problem! Our cabinets will mix and match accordingly and are easy to mount together for seamless looks. If it's durability and quality you're after, then look no further! 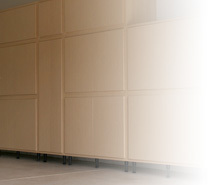 Our plywood cabinets outlast and out-perform our competitors cheaper and inferior particle board cabinets. Particle board is not the same as quality plywood. Particle board will chip, deteriorate, and not last as long as plywood cabinets. Not to mention, if you get particle board wet or in a moist or damp environment it will sag and fall apart on itself effortlessly. Whereas plywood is much stronger, made of sheets, and some of the most durable materials to use in cabinets and home furnishings. For questions, comments, or your Free Estimate, please call us today at 317-773-3051. We can get your storage project started started today! For our Sitemap/Link directory please click here.